"Beyond the completion of a 3,000-mile journey, mostly under amusing conditions, through a little-known part of the world, and the discovery of one new tributary to a tributary to a tributary of the Amazon, nothing of importance was achieved." Nothing indeed. 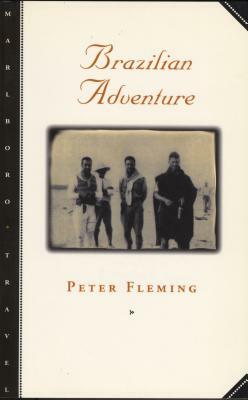 In 1932, Peter Fleming, a literary editor, traded his pen for a pistol and took off as part of the celebrated search for missing English explorer Colonel P.H. Fawcett. With meager supplies, faulty maps, and packs of rival newspapermen on their trail, Fleming and his companions marched, canoed, and hacked through 3,000 miles of wilderness and alligator-ridden rivers in search of the fate of the lost explorer. One of the great adventure stories, Brazilian Adventure is as fresh a story today as it was when originally published in 1933. Peter Fleming (1907-1971), the brother of novelist Ian Fleming, wrote for the London Evening Standard, the Spectator, the BBC, and the Times of London. His travels took him to Mexico, Brazil, Russia, China, Japan, Tibet, and Manchuria. He died in a hunting accident in Scotland.